As you grow older, your face changes in many ways. You may notice a change in the appearance of your skin, typically in the form of deepening lines and wrinkles around the mouth. But what may be less obvious is “age-related midface volume loss” in which collagen production slows, cheeks flatten, and skin begins to sag. To address this, Juvéderm Voluma® XC is designed to add volume beneath the skin’s surface in order to lift and contour the cheek area. It’s the first FDA-approved hyaluronic filler to add volume to the cheek—helping to create a more youthful appearance. Plastic + Hand plastic surgeons are experts in facial aesthetics and have the depth of experience necessary to provide results you’ll love… with the respect you deserve. Juvéderm Voluma® XC is an injectable dermal filler with a base of hyaluronic acid. The procedure takes 15 to 60 minutes, depending on the areas involved. 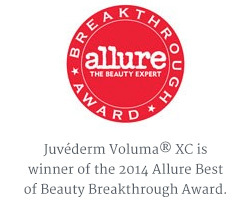 How long will Juvéderm Voluma® XC last? Results are often noticeable immediately after the procedure. With optimal treatment, Juvéderm Voluma® XC is the only filler proven to last up to 2 years in the cheek area. When treated again after 2 years, patients needed less product to achieve their results. The most common side effects are injection-site redness, swelling, pain, tenderness, firmness, bumps, bruising, discoloration, and itching. Side effects last from 2 to 4 weeks. Earn Brilliant Distinctions points each time you receive Botox® Cosmetic, Kybella® XC, Juvéderm® XC, or Juvéderm® Voluma XC treatments, or purchase Latisse® products. Have questions? Visit BrilliantDistinctionsProgram.com or contact the Brilliant Distinctions call center at 888-324-2745. Skin Solutions at Plastic + Hand offers a loyalty program for our patients. Learn more by visiting our Loyalty Program page. Each and every patient is unique. It’s important to us that we listen to our patients from the outset, so a consultation is the first step in determining whether Juvéderm Voluma® XC is appropriate for you. Consultation and Juvéderm Voluma® XC injections can take place during the same appointment. When your consult and injections take place on the same day, the consult fee of $50 is waived. Call us at 775-3446 to schedule a consult. Questions? Click here. Not only therapeutic, injectables can prevent wrinkle development. Here’s what you need to know about skin care at Plastic + Hand. Hours: Mon-Fri, 8 a.m. – 5 p.m.